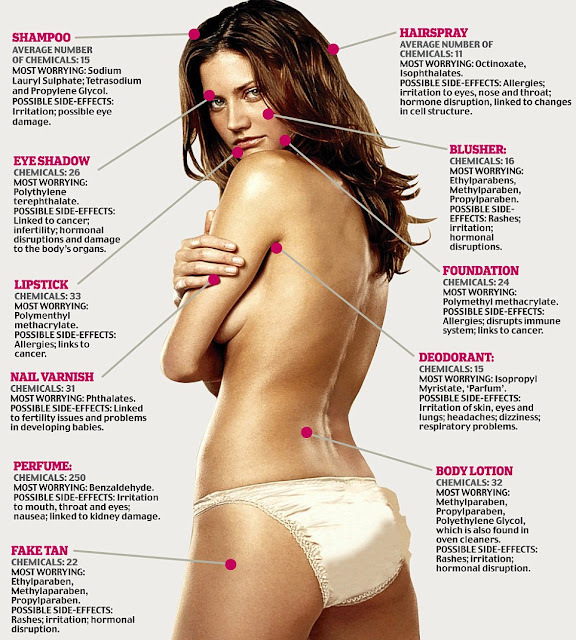 delicious wife: are your beauty products toxic? ever wondered what's in your shampoo, body wash, shaving cream, lotion, or makeup? what about your toothpaste? i know my little guy swallows some everyday. that got me to thinking. i care so much about what goes in our bodies, so what about the stuff that goes on our bodies? i don't even try reading the ingredients. i can't pronounce half of the words. and, if i can pronounce them, i still don't know what they mean. they just can't be good. so, i went on a quest to find the safest, gentlest, most natural products for my baby, for my family. that's when i stumbled across the Environmental Working Group's (EWG) Skin Deep Cosmetic Database. it's exactly what it sounds like. you can search for just about any beauty or grooming product and find out what's really in it. the best part is EWG did all the hard work for you. every product in the database has a hazard score. the score is based on the ingredients and studies available on the product. did you know that products like shampoo, lotion, and nail polish contain chemicals that haven't been tested and are not required to be tested for safety. these chemicals have been linked to cancer, read this. and, there also a link to birth defects, low sperm count, and pregnancy problems, read this. it's nearly impossible to eliminate all of chemicals in my life. but, i've made a few changes that make a big difference. i order some stuff from web, but most of them i can find at my local drugstore.